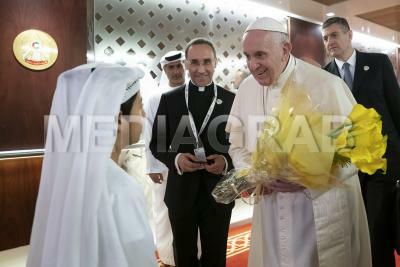 His Holiness Pope Francis was met at Abu Dhabi Presidential Airport met by His Highness Sheikh Mohammed bin Zayed Al Nahyan, Crown Prince of Abu Dhabi and His Eminence the Grand Imam of al-Azhar, Dr. Ahmed At-Tayyeb. The historic visit is the first time a Pope has ever visited the UAE and the Arabian Peninsula and during the visit His Holiness will be participating in the Human Fraternity Meeting with the Grand Imam. A Papal Mass is set to be the highlight of the visit and will be conducted by His Holiness Pope Francis on Tuesday 5 February at Zayed Sports City, an event that is expected to attract up to 135,000 people, with the Mass being live-streamed across the globe. 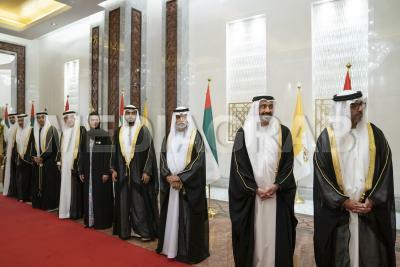 Both religious leaders accepted the invitation of His Highness Sheikh Mohammed bin Zayed Al Nahyan, Crown Prince of Abu Dhabi and Deputy Supreme Commander of the UAE Armed Forces, to attend the UAE’s inaugural Human Fraternity Meeting, to be held in Abu Dhabi tomorrow. They will also visit together the Sheikh Zayed Grand Mosque and the Pontiff will also meet with the Muslim Council of Elders of which His Eminence the Grand Imam is Chairman.